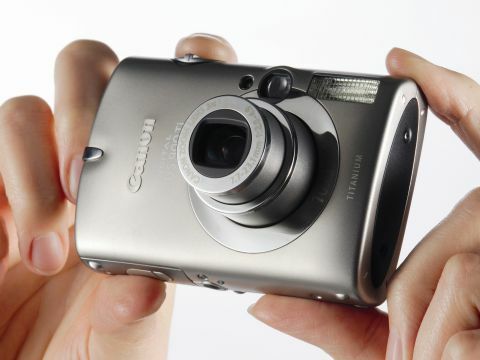 It's ten years since the first camera was launched in the Canon IXUS range. A lot has changed since 1996 and manufacturers are now stuffing 10MP sensors into compacts and DSLRs alike. But Canon hasn't just upped the resolution stakes; this model also showcases its new DIGIC III image processor with Advanced Noise Reduction and Face Detection technology. The appearance of the 900Ti is more evolution than revolution, as it bears a distinct resemblance to its predecessor, the Digital IXUS 750. One of the main differences that you can't fail to notice is the titanium finish. The dimensions are pocket-size and the curved shape makes it attractive, even though its rounded base means it's easy to knock over. Luckily, the build quality feels robust and there's not a hint of a rattle. Start-up time is impressively quick, with the camera ready to shoot in around a second. The compact nature of this camera doesn't have an adverse effect on its handling as buttons and dials are kept to a minimum. All the controls are located on the side of the model, so adjustments can be made with the (right) thumb and forefinger. Users can choose to use the camera in Auto, Manual, Movie or Special Scene mode, with eleven options catering for most shooting scenarios. The 2.5-inch LCD is easy to see in both bright and low light and it offers a good view, even at oblique angles. Strangely, even with such a fine screen, an optical viewfinder is still included. This is small, hard to see through and has an obvious parallax error - it's difficult to understand why Canon has bothered with it at all. The 900Ti performs impressively well for a camera of its type. There's hardly any shutter lag and it doesn't lock up when capturing full-resolution images. Photographers who find the 37-111mm range limiting will have to satisfy themselves with a 12x digital zoom and accept smaller resolution images files. Users of the Movie mode won't be disappointed. The quality goes up to 1024 x 768 pixels at 15fps, and when played back on a PC (with QuickTime Player) it's easy to imagine that these smooth-moving pictures were produced on a dedicated camcorder. The 900Ti really excels when shooting portrait subjects. The camera delivers swift and decisive focusing and it also benefits from the Face Detection facility, activated using the straightforward menus. This new technology works with a nine-point AiAF to rapidly detect up to nine people in a shot and adjust the focus accordingly (it's also intuitive enough to automatically disable it for non-people pictures). This camera is really designed for people wanting easy-to-use automatic exposure. Users might have the impression that there's full manual exposure control but they'll soon discover that the 'M' option only enables adjustments to settings like white balance, metering, exposure compensation and the impressive ISO range from 80 to 1600. There's also a special ISO 3200 setting buried in the Scene mode. Image quality tends to be a little soft unless the camera is set to a low ISO and used in bright lighting conditions. It gets progressively more blurred as the light drops and the ISO is cranked up. It's worth noting that the IXUS displays very low noise levels at all ISO settings, but it seems that any potential grain is blurred with in-camera processing. If the IXUS 900Ti set out to be an easy- to-use camera, purely for capturing portrait images, then it's succeeded. Other results are adequate but they won't be enough to satisfy more demanding users.